Kindly bear in mind that billing data is unfortunately promulgated by the Satellite Operator after they have collated the traffic from their land earth stations (and those of the other major stake holding companies) from around the World. This means that the dated invoice can relate to the preceding month’s traffic or even the traffic for the month before that (i.e. there is commonly one or even two months delay). For that reason please review the date range for the airtime traffic passed and to which the invoice relates carefully. 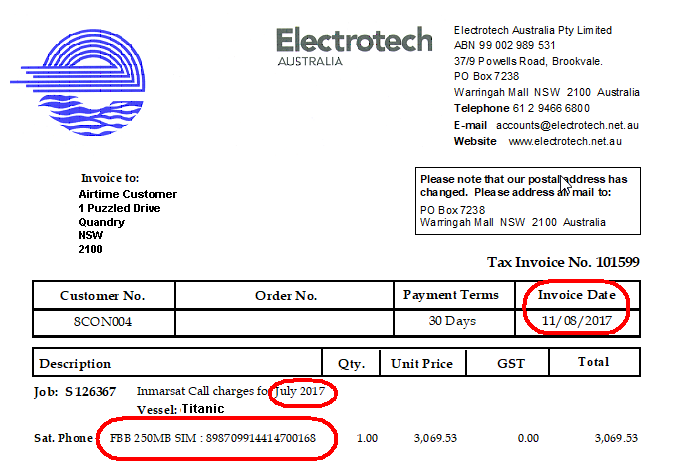 In the below example please note in the top right hand side the invoice date (August) but down below that the month for which the call charges (traffic) relating to the invoice is in fact July.